Tumbler Pigeons have been named for their ability to spin and "tumble" in flight. This fascinating trait has been reported in domestic pigeons for centuries and is believed to be a survival skill that these birds developed to evade aerial attacks by birds of prey. This skill was then further refined by selectively breeding particularly talented Rock Pigeons until the official breed "Tumbler Pigeons" was born. 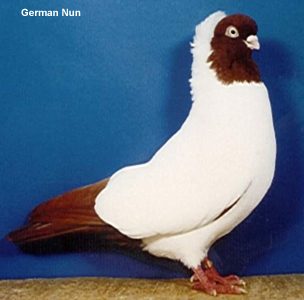 To this day, this breed is still considered an evolving breed, as pigeon fanciers work to perfect their tumbling abilities as well as other desirable features, such as coloration of their plumage and other physical features. 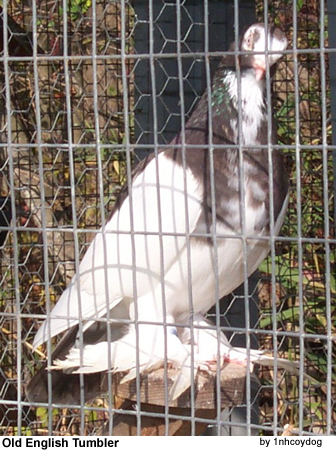 These fascinating pigeons are often presented at events to perform flying demonstrations - both to show of the pigeon fanciers' training abilities as well as to increase awareness and interest in the breed..
Tumbler Pigeons have been around since before the 1500's and nowadays can be found around the world. These birds are favorites at pigeon shows, as they perform in mid-air, tumbling or rolling over backwards, or side to side. Theseunique aerobatic summersaults are sure to delight and entertain those that get to watch these spectacles. Some well-trained birds have been reported to be able to fly more than 8 to 10 hours. In recent history, they have also grown in popularity as pets due in large part to their personality and antics. The homing abilities have been deemphasized over time and are, therefore, under-developed compared to Homing Pigeons. 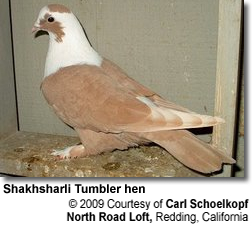 This being said, many original "tumbler" pigeons are nowadays mostly used as show breeds, and some argue, many have lost some of their tumbling capabilities as more importance was placed on their physical characteristics (colors, forms) when selecting breeding birds rather than their aerial abilities. Tumbler Pigeons occur in a wide variety of specialty breeds, plumage colors, body types, as well as feather configurations. 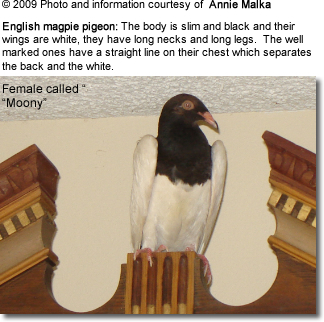 Plumage colors: These birds come in different plumage colors, such as blue, black, brown and white. The head is round, with a forehead that appears to be protuding a bit if compared to the regular pigeons. The beak can be of short or medium length. Its color varies by the color of the pigeon. The cere (fleshy skin above the beak) is round in shape. The neck is usually thick. It shouldn't be too short. The primaries (= longest wing feathers) should be long and well-built to enable them to undertake long flights. The eye color also varies, but pearl-colored or yellow eyes are preferred in some breeds. They require a well-built pigeon loft that allows them to get out and about as they wish to fly, or to return to their home loft to feed, find protection from adverse weather conditions, and give them a safe place to reproduce. Tumblers are not picky as far as food is concerned. They willingly accept a variety of fruits, vegetables, grains, seeds and pellets. Some breeders supplement their diet with grits / gravel, vitamins and calcium. It is important not to overfeed them or they will become obese and lose interest in performing. The amount of food varies by size of the pigeon and the kind of food they are given. Many commercial pigeon feeds are available. If performance and good health is a high priority, a good quality feed is necessary. Water is essential for good health as well as condition of their plumage. Fresh and clean water needs to be available throughout the day. Iranian Highflying Tumblers: Bred in Iran specifically for endurance flying competitions. The tumbling is more of a flip preceded by the occasional hovering. Komorner Tumblers: Originated in the city Komárno in Austrian Empire (on the current Slovak-Hungarian border).